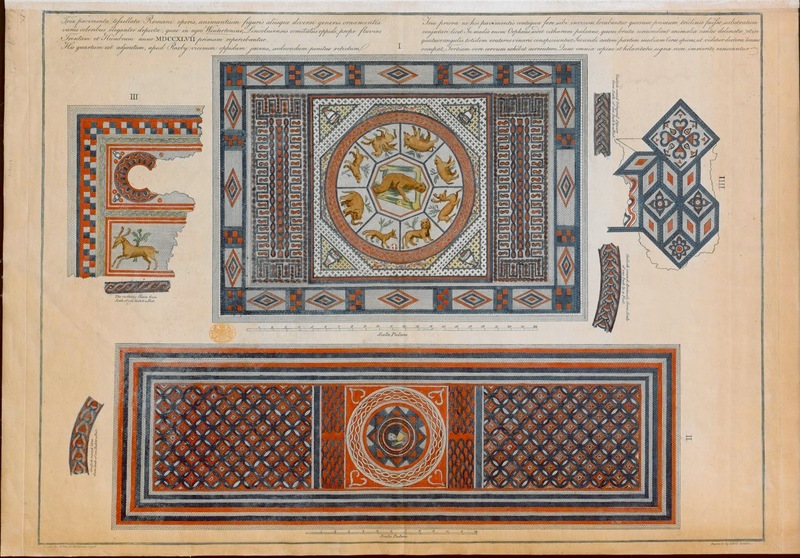 The following post collects together a number of the eighteenth- and nineteenth-century illustrations of Roman mosaics found in Lincolnshire, starting with the mosaics found at a major complex discovered during mining at Greetwell Fields, Lincoln. 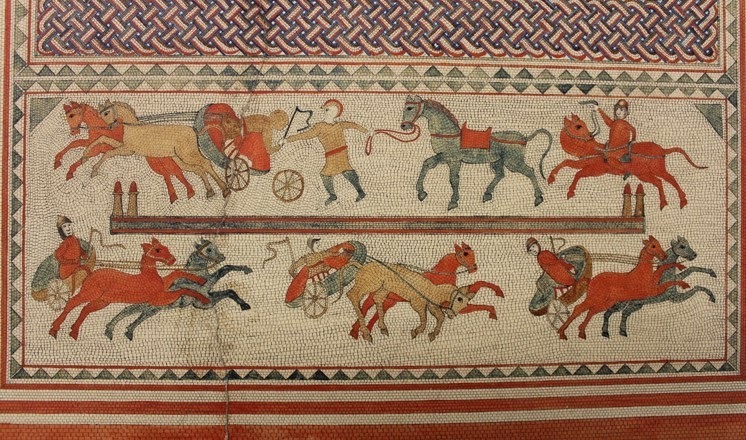 The Greetwell mosaics were found in approximately the area of the current Lincoln hospital during ironstone mining from 1883–94, with their discovery commemorated by the modern street-name 'Roman Pavement'. The mosaics discovered here have been described as being of 'palatial scale and quality' and were part of the decorative scheme of an exceptionally large Roman villa-palace, which occupied a magnificent position on the hilltop overlooking the Witham valley, probably originally in the form of a very large courtyard surrounded by four immense corridors, off which were located the main accommodation, baths suite and the like. It has been argued that this villa-palace is likely to have been the official residence of the governor of the Late Roman province of Britannia Secunda, the capital of which was Lincoln, with the villa-palace appearing to have been occupied right up until the end of the coin sequence in the early fifth century and maintained to a high standard. Needless to say, the last points above are of considerable interest in light of the hints of possible post-Roman provincial continuity discussed previously, and in this light it is also important to note the recent suggestion that the villa-palace's estate was actually preserved intact throughout the whole of the Anglo-Saxon period and into the medieval period, with its reconstructed boundaries matching those of the later Monks Leys estate almost exactly (the latter is first recorded just after the Norman Conquest, but has been considered to potentially have its origins in a pre-Viking minster estate). 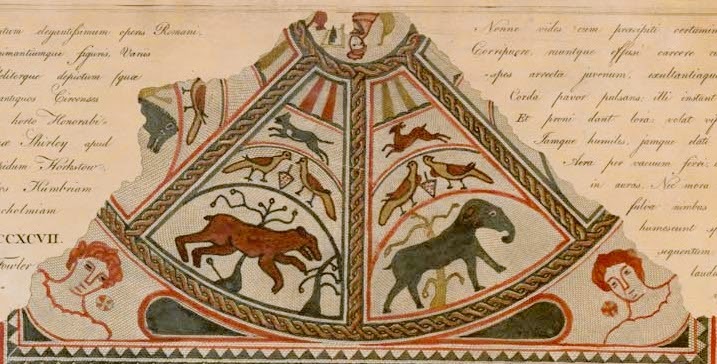 A case has also been made for the early medieval and later tenurial arrangements of a large region to the north of the Witham and east of Lincoln and Ermine Street to have had their origins in two large territories dependent upon the Greetwell villa-palace and a more modest, but still significant, villa at Scupholme. Although these relics of a remote age are being dug up and are being destroyed, it is not the fault of Mr. Ramsden, for he not only preserved them as long as he conveniently could, but he also had the soil removed from over them, and had them thoroughly washed, in order that people might have an opportunity of seeing their extent and beauty... Mr. Ramsden, the manager of the Ironstone Works, is keeping a plan of the whole of the pavement, which he is coloring in exact imitation of the original work. This, when completed, will be most interesting, and he will be quite willing to show it to any one desirous of inspecting the same. 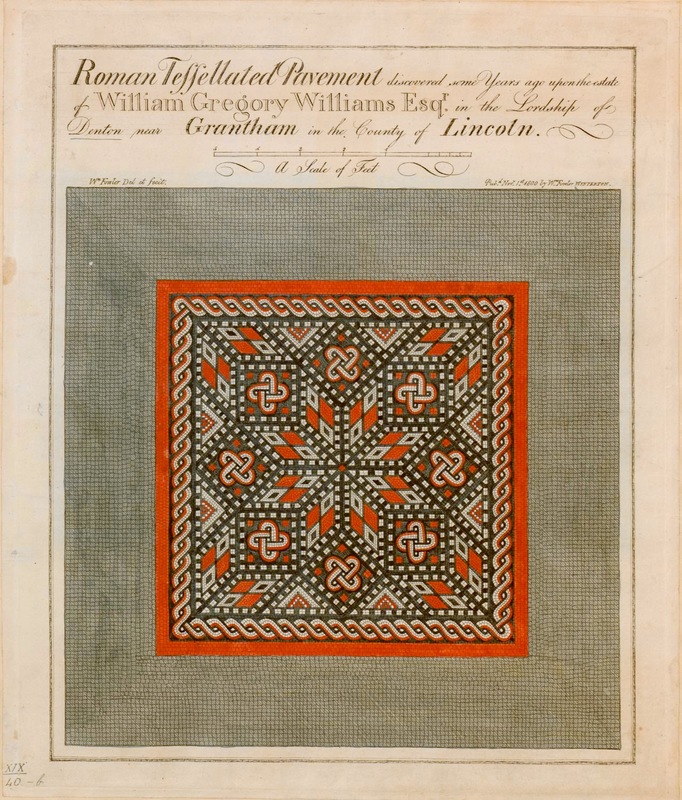 Although the Greetwell villa-palace is almost certainly the most important villa in the Lincoln region, it was by no means the only one, and the second half of this post brings together and shares a number of antiquarian illustrations of mosaics found at some of these other villas, all of which were drawn and/or published by William Fowler of Winterton (1761–1832). 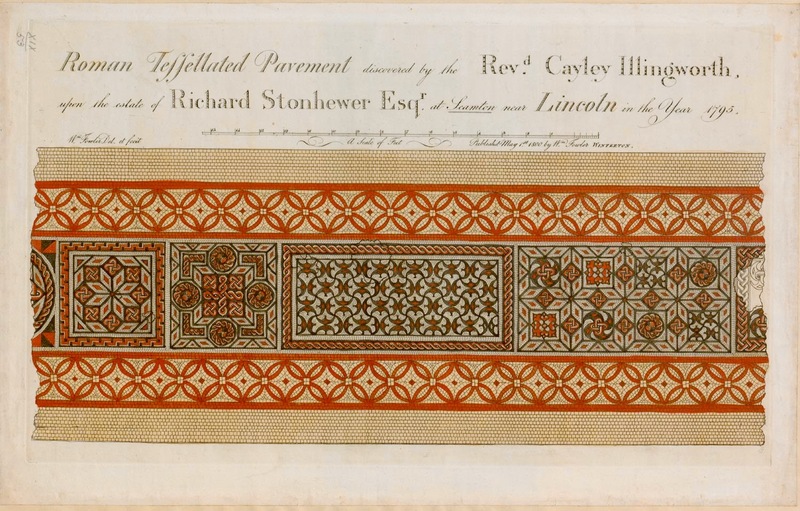 In the year 1795, some workmen, digging for stone in a field south-east of the village, and north of Tilbridge-lane, were observed to turn up several red tiles, which, on inspection, Mr Illingworth conceived to be Roman. This induced him to survey the general appearance of the surrounding spot; and being struck with obvious traces of foundations, he directed the men to dig towards them, when they came to a wall two feet beneath the surface, and shortly after to a Roman pavement. 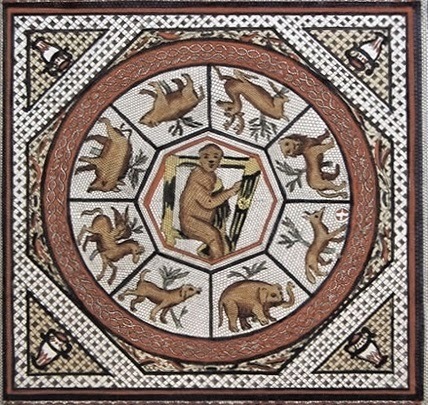 The result was, that the foundations of nearly a whole Roman villa were traced and accurately examined; and the situation of the place, the nature of the walls, the dimensions of some apartments, the number and beauty of the tessellated pavements, and the regular plan of the whole, leave little doubt of its having been a villa of considerable distinction and elegance. that these graves were located in central locations within two rooms and their fill contained no roof tile, slate or similar evidence of villa destruction, only tesserae, implying that the villa still stood and had not fallen into complete disrepair even by that late date. 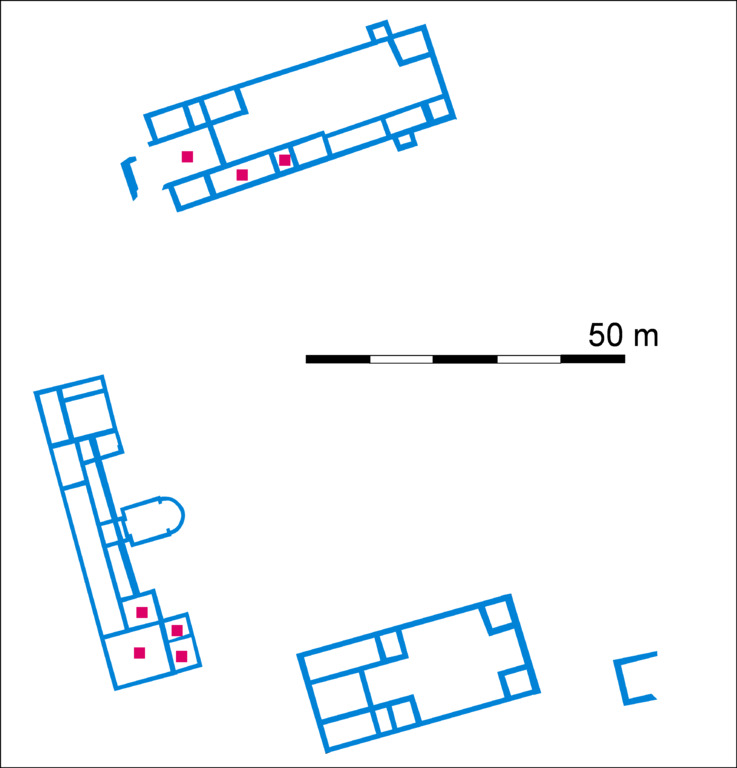 Plan of Denton Roman villa, showing Phase II in white, constructed c.370 or after, and the rebuilding of Phase III (black), dated to probably the fifth century. 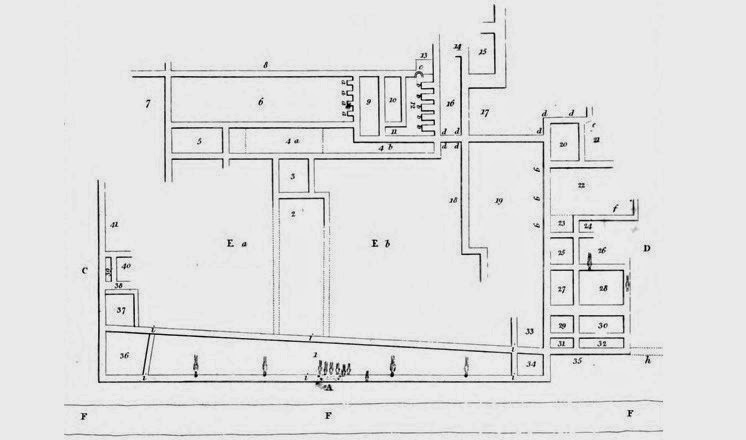 Click the image above for a larger version of this plan, which is Smith, 1964, fig. 3. 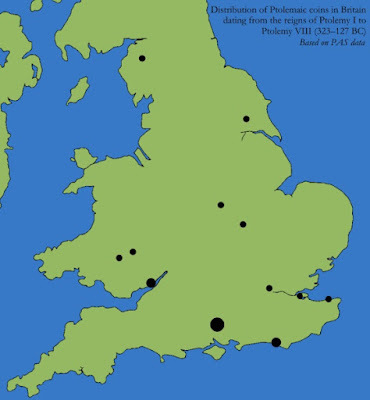 The primary aim of the following post is to very quickly share a distribution map of Ptolemaic coins that have been recorded from Britain on the PAS. The coins mapped and briefly discussed below date from the reigns of Ptolemy I to Ptolemy VIII, c.323–127 BC, and were minted in Egypt, Cyprus and Libya. 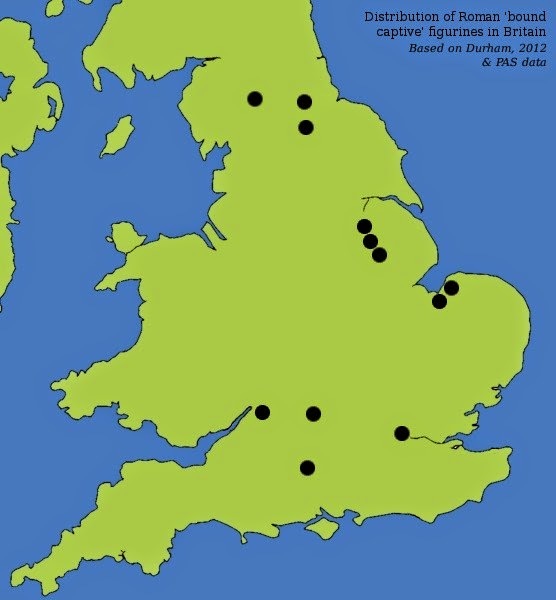 As can be seen from the above map, the PAS records a small but significant number of these coins from Britain, many of which were found on or near to the coast or major rivers. 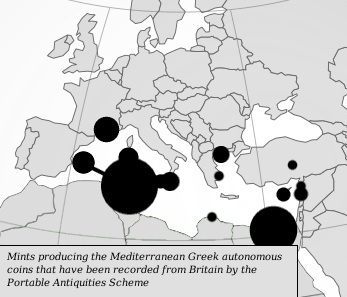 Jennifer and Lloyd Laing, writing before the PAS came into existence, noted that the corpus of 'Greek autonomous issues' then known from Britain was dominated by Carthaginian coins, rivalled only by Ptolemaic issues, and the finds recorded from the PAS reproduce this pattern, as can be seen from the following map of mint sites of Mediterranean Greek autonomous issues. 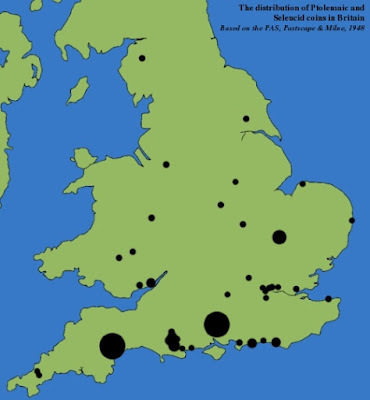 The varying size of the circles depicted on this map reflect the relative numbers of pre-Roman Greek coins from that mint that have been recorded from Britain by the PAS, with Carthaginian issues (minted in North Africa, Sardinia, Sicily and Ibiza) clearly most common of all, but Ptolemaic issues (minted in Egypt, Cyprus and Libya) a close second, and then coins from other areas and dynasties—such as Marseilles, Macedonia and the Seleucid Empire—being much less frequently found. Needless to say, a key question with regard to these coins is whether they are best seen as modern or ancient losses. With regard to this, several points can be made. First, the PAS coins do not stand alone, but instead form part of a larger corpus of Ptolemaic coins found in Britain over the course of more than a century, which is sufficiently substantial that we would have to assume a quite surprising and arguably implausible number of careless nineteenth- and twentieth-century coin collectors existed in Britain in order to explain it away. 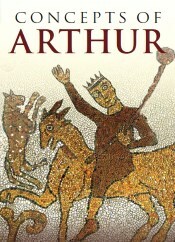 As Martin Biddle argued in 1975, when discussing the eight to ten Ptolemaic coins found in and around Winchester (Hampshire) during the nineteenth and twentieth centuries, 'the proverbial absent-minded college don or cathedral canon, dropping items of his collection here, there and everywhere... has never seemed a very convincing character', and the number of finds and extensive time period over which they have been made means that these coins should probably be seen as genuine ancient losses unless there is obvious evidence to the contrary, rather than modern losses or even hoaxes. Second, if some of the Carthaginian coins are thought to have been ancient losses that arrived during Britain's Iron Age, rather than in the Roman period, then there seems little reason why the same cannot be true of the Ptolemaic issues too. Indeed, it is worth observing that, for example, the Winchester coins are probably to be associated with the Middle to Late Iron Age oppidum at Winchester. 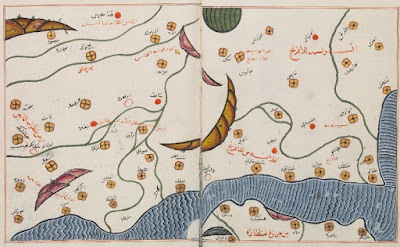 Third and finally, the map of coin mints included above does not look quite how we might expect it to if the Greek autonomous issues that have been found in a Britain were simply a random selection of losses from modern-era ancient coin collections. As was the case with the pre-PAS finds that Jennifer and Lloyd Laing mention, the PAS dataset is clearly dominated by Carthaginian and Ptolemaic issues, with, for example, notably fewer Macedonian, Anatolian, Syracusan, or pre-Hellenistic (Classical) Greek autonomous coins represented. 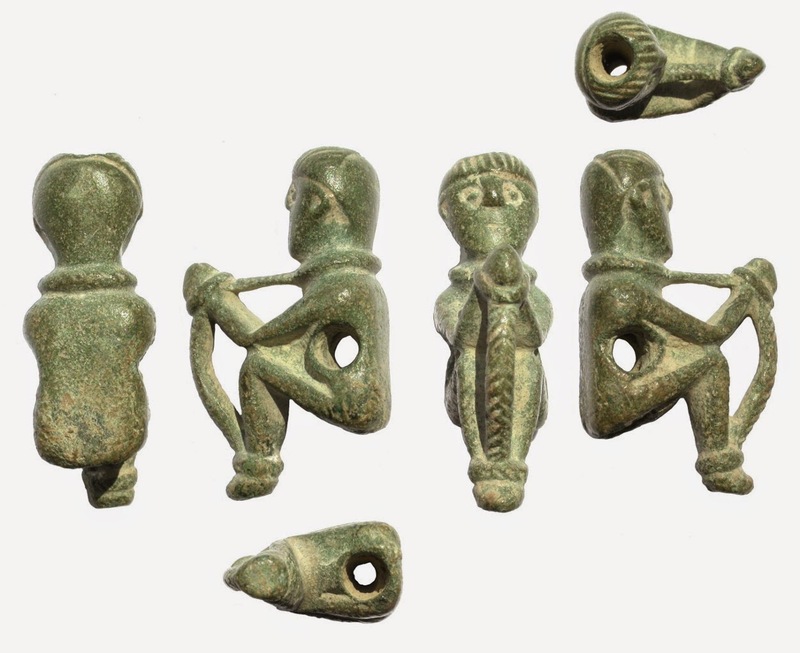 This differential loss is interesting and might well inspire some confidence that many of the pre-Roman Greek coins that have been been found in Britain are indeed genuinely ancient losses. The distribution of all coins from the neighbouring Hellenistic Ptolemaic and Seleucid Empires that have been found in Britain through to 2015, as recorded by the PAS, Pastscape and Milne (image: C. R. Green). Note, the predominantly coastal and riverine distribution of these coins is of some potential interest in light of the discussion of the possible origins of Ptolemaic coins found in Britain offered above, and it is furthermore worth observing that at least one person buried in fourth–third century BC Kent is now thought likely to have actually grown up in the Nile Delta. Although the majority of the coins plotted here are Ptolemaic, a small but notable proportion are Seleucid, particularly from Exeter; in 1987, Malcolm Todd followed Milne and Goodchild in arguing that these coins may credibly reflect visits by eastern Mediterranean traders to the Exe Estuary/south coast in the pre-Roman period (and note here the Mediterranean anchor and Mediterranean-style harbour of this period recently discovered at Plymouth and Poole, respectively), although the Exeter collection of Hellenistic and later coins has also been conversely subjected to a degree of (arguably somewhat hypercritical) scepticism by George Boon too. Map of the Ptolemaic and Seleucid Empires in c. 200 BC, drawn by Thomas Lessman (image: Wikimedia Commons, CC BY-SA 3.0). Aside from cropmarks, very little now remains of Ketsby, a Deserted Medieval Village (or, more correctly, a Shrunken Medieval Village) that is located in a valley between two ancient trackways in the Lincolnshire Wolds. Nonetheless, the archaeological and historical material relating to Ketsby suggests that this was a place of some local significance, and one which saw notable activity in every period from the first century through until the sixteenth. The following post offers a very brief discussion of the site and the finds that have been made there. The site of Ketsby DMV, showing only as faint cropmarks on this aerial photograph. The church is said to have been located just to the north of the buildings visible here, with the main focus of the cropmarks lying to the north and east of Ketsby House, where there were still earthworks in the 1940s. Click here for a zoomable view of this area. 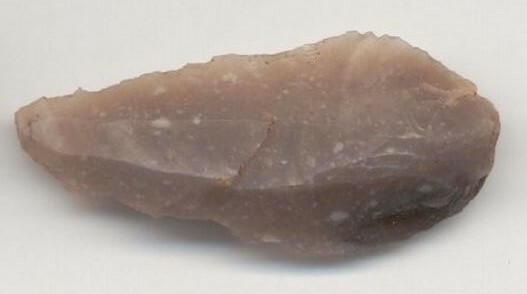 The earliest evidence for human activity at the Ketsby DMV consists of a Late Neolithic–Early Bronze Age flint knife, dated to sometime around 3000–2000 BC, and a cropmark of a probable Bronze Age round barrow (with a diameter of around 15m). These are, however, the sole representatives of the prehistoric period currently known from the site, with all other finds from here probably dating from the first century AD and after, starting with a Late Iron Age 'dangler' or 'hanger' and a late first-century Roman coin of Vespasian. With regard to the Roman period, although there are not a vast number of finds recorded on the various databases, there are enough to indicate that there was probably a settlement here from the first century AD through until at least the very late fourth or fifth century. Not only do we have the two first-century finds mentioned above, but the East Midlands Anglo-Saxon Pottery Project (EMASPP) recorded various pieces of Romano-British pottery from the DMV, and there are a number of other items of metalwork too, including a lead-alloy Roman foot in a sandal (possibly a votive piece or part of a fairly substantial statuette), a second-century plate brooch, a late fourth- or early fifth-century Romano-British 'dolphin and bird' buckle, and a clipped silver siliqua of Arcadius, minted 395–402. The last two items are particularly interesting, suggesting that British activity continued at the site into the fifth century. 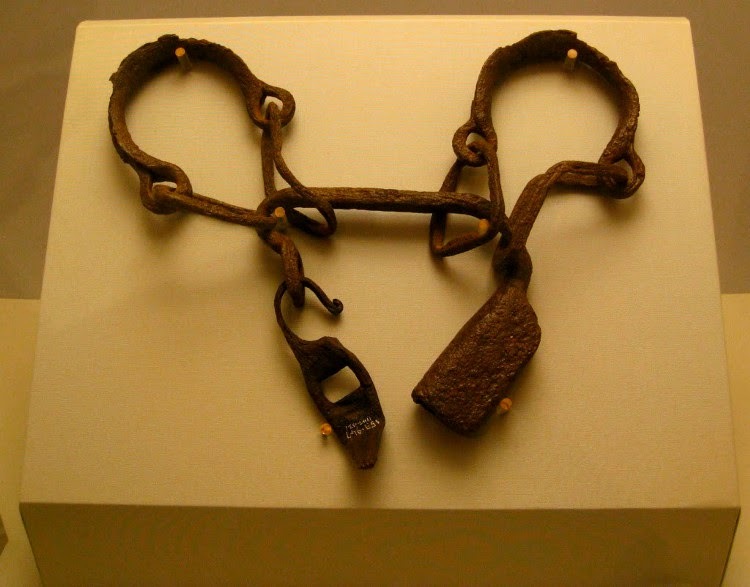 Moving on to look at the Middle Saxon period (the seventh–ninth centuries), there is a notable increase in the amount of material produced by the site. In addition to various pieces of Middle Saxon pottery recorded from Ketsby DMV by the EMASPP, including some eighth- to ninth-century Maxey-type ware, metal-detecting has recovered no fewer than 12 items from the site. 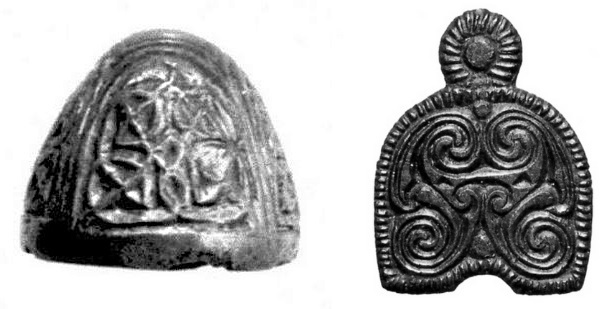 These include four eighth- to ninth-century polyhedral dress pins; an eighth- to ninth-century globular headed dress pin; a seventh- to ninth-century dress hook; two or three Middle Saxon strap-ends; a Mid-Late Saxon dress pin, and a possibly seventh-century purse mount/strike-a-light. 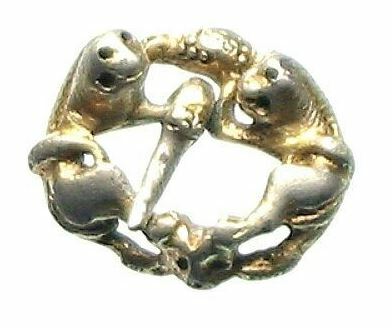 Perhaps most interesting of all, however, are a silver-gilt mount of the eighth century and an 'Irish' pressblech die of the seventh century. The first of these has its parallels in the St Ninian's Isle treasure and in an eighth-century silver-gilt mount found in Leicestershire. and is a lovely piece. The second of these is a metalwork die for making silver or bronze foil mounts, and is again a very significant find. Needless to say, the above evidence for a significant degree of pre-Viking activity at Ketsby DMV is interesting given the Scandinavian -bȳ place-name attached to the DMV (Ketsby is Chetelesbi in Domesday Book, which derives from Scandinavian Ketil + bȳ, 'Ketil's village'). Such names have often been thought to mainly represent new Viking settlements of the late ninth century founded on previously unused sites, but this is clearly not the case here, just as it is not at the Maltby DMV near to Louth, which has similarly seen Romano-British, early Anglo-Saxon and Middle Saxon finds recovered from the DMV, along with later Scandinavian-era and medieval material. 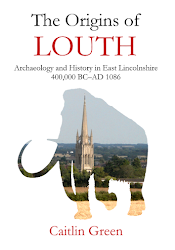 A more plausible scenario is perhaps that this Ketil took over a pre-existing Anglo-Saxon settlement on the site of the Ketsby DMV in the later ninth or tenth century and that the modern place-name records this change in lordship. Although we can only speculate as to the pre-Viking situation at Ketsby, it is worth noting that only a third of a mile to the north of the site is Walmsgate DMV. 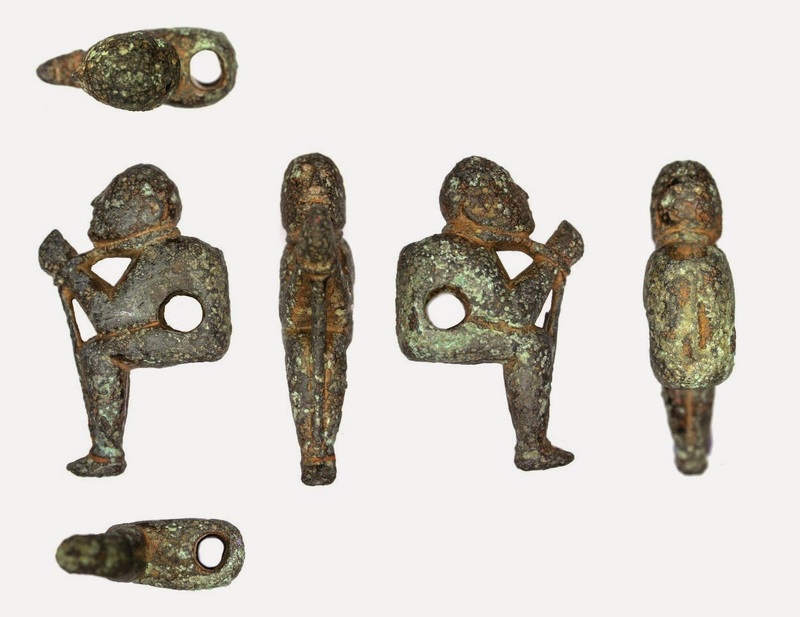 Unlike at Ketsby, no Anglo-Saxon or Anglo-Scandinavian artefacts have yet been recorded from Walmsgate DMV on any of the available databases, although a small coin hoard of the 870s was recovered from somewhere in the parish in the 1980s. What Walmsgate does have, however, is an Old English name that derives from OE Waldmǣr or Walhmǣr + gāra, probably meaning 'Waldmǣr's or Walhmǣr's triangle of land' according to Cameron and Ekwall. 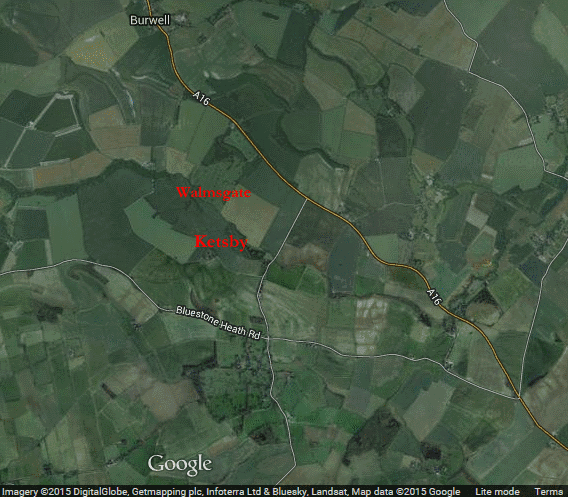 In this context it is worth noting that both Walmsgate and Ketsby are not only extremely close to one another, but are also located in a valley on opposite sides of a stream and between two probably prehistoric trackways (now the A16 and the Bluestone Heath Road) that come together to meet at a point to the south-east of Walmsgate and Ketsby, enclosing a large triangle of land between them. It might be wondered whether this area was originally the 'gore' or triangle of land that belonged to the Anglo-Saxon Waldmǣr/Walhmǣr, with the settlement now known as Ketsby therefore being, in the pre-Viking period, a part of this estate—perhaps an important part—before it was split off to form a separate unit that, at some point, came under the lordship of Ketil? The location of Ketsby and Walmsgate; for a zoomable version of this image, click here. 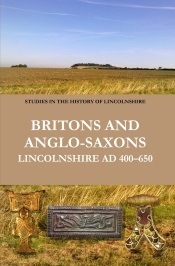 Whatever the case may be on the above, the Anglo-Scandinavian period (late ninth–eleventh centuries) appears to have seen an even greater degree of activity at Ketsby. 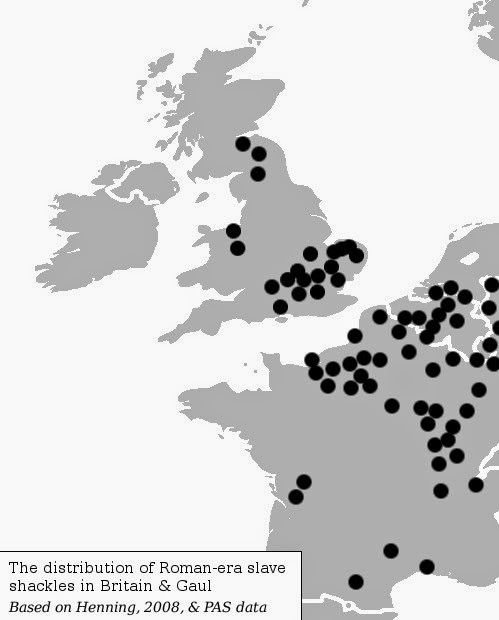 Once again, pottery of this era—'Late Saxon' and 'Saxo-Norman'—is recorded from the site by the EMASPP, now supplemented by 27 metal-detected finds recorded on the PAS and the UKDFD, and a very significant cluster of 'Viking coins' noted at this location by Kevin Leahy in 2007. 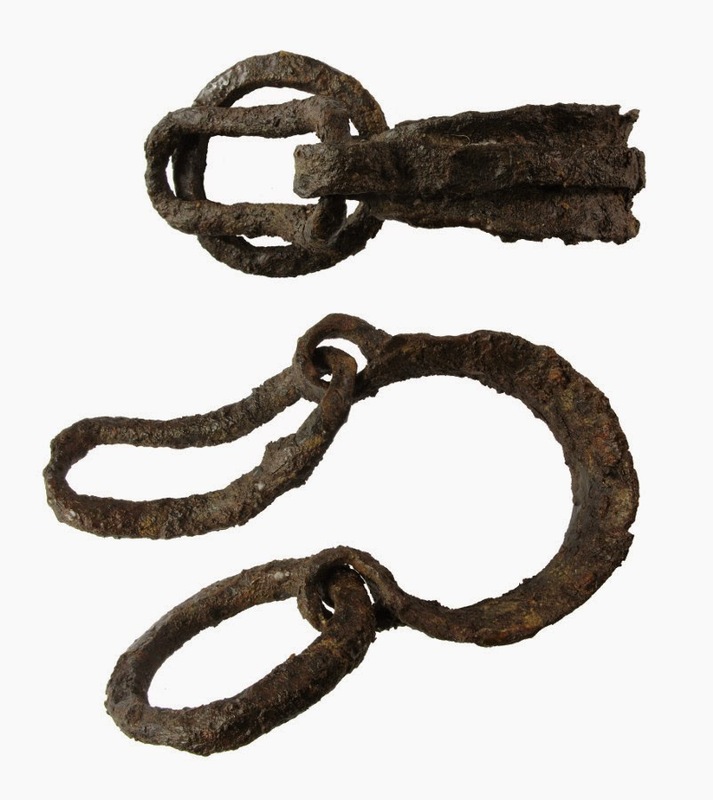 The metalwork found includes multiple hooked tags, strap-ends, lead-alloy disc brooches, stirrup mounts, and pieces of Urnes-style metalwork from this period, along with a fragment of a Viking trefoil brooch. 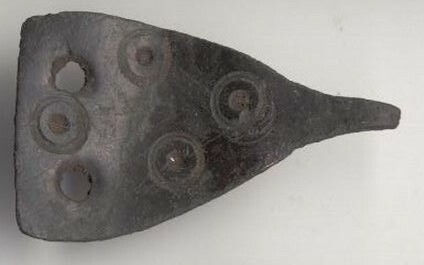 Furthermore, there is once again probable evidence for metal-working from the site, with finds of a Viking Jellinge-style die of the late ninth to mid-tenth century and a probable lead-alloy pattern used to produce copper-alloy strap-ends from clay moulds, both of which are most interesting given the general rarity of evidence for the production of Scandinavian-style metalwork in eastern Britain. With Domesday Book and the medieval period, Ketsby emerges into the historical record. 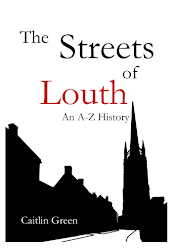 In Domesday, Ketsby appears as a medium-sized settlement under the lordship of Godric in 1066 and under Hugh in 1086, with one mill, six villains, one bordar and eleven sokemen recorded in 1086, whilst Walmsgate appears only as sokeland of Ketsby in the Domesday Book, with no villains or similar listed there, which is interesting in light of the suggestions made above. Moving forward in time, the Pastscape record follows Beresford's Lost Villages of England (1954) in recording that a fair and market was held at Ketsby in the medieval period, although the market was certainly a new innovation of the early sixteenth century, being instituted in 1524. With regard to the archaeology, the UKDFD indicates that the coin evidence from the site clusters 'around the Conquest period' and the PAS notes a coin of William I found on the site, along with some later medieval issues and an eleventh- or early twelfth-century Italian coin. 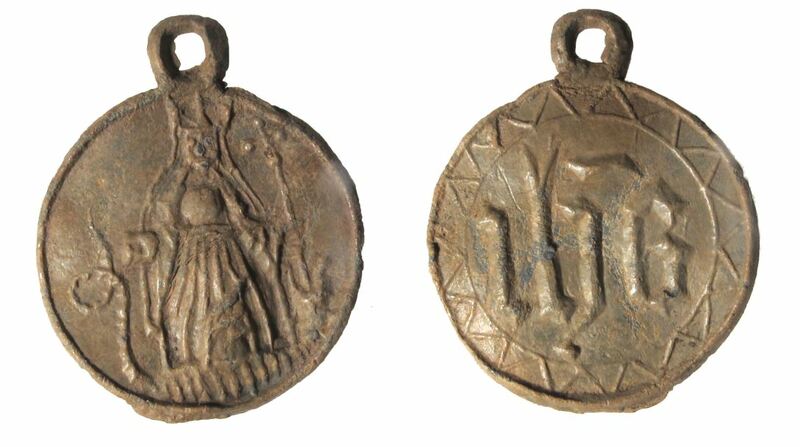 Non-coinage medieval finds recorded in the various databases include pottery, a lovely silver-gilt brooch of the thirteenth century decorated with lions, a papal bulla of Gregory IX (1227–41), and 30 or so other items including bells, brooches, buckles and strap-ends. Perhaps the most significant medieval finds from Ketsby are those of a religious character, however. These include a four pilgrim ampullas of the fourteenth to fifteenth centuries, a fifteenth-century St Blaise pilgrim badge, and eight pilgrim badges depicting St Margaret of Antioch, dating from the fifteenth to sixteenth centuries. The latter are particularly interesting, representing the greatest concentration of such pieces known from Late Medieval England by a significant margin. Furthermore, the distribution map of such badges recorded on the PAS and UKDFD shows that almost all of these items come from Lincolnshire and that they appear to be distributed around Ketsby. In light of this, it might well be wondered whether this apparently local manifestation of the generally widespread cult of St Margaret of Antioch might not have had its focus and centre at Ketsby itself? Needless to say, this suggestion gains considerable weight from a consideration of not only the potential evidence for the production of these St Margaret pilgrim badges at Ketsby, but also the fact that the lost church of Ketsby was dedicated to St Margaret and actually contained a medieval image of St Margaret that was still attracting notable offerings in 1529! As such, there would seem to be a very good case for Ketsby having been a local pilgrimage centre for the cult of St Margaret in the late medieval period. 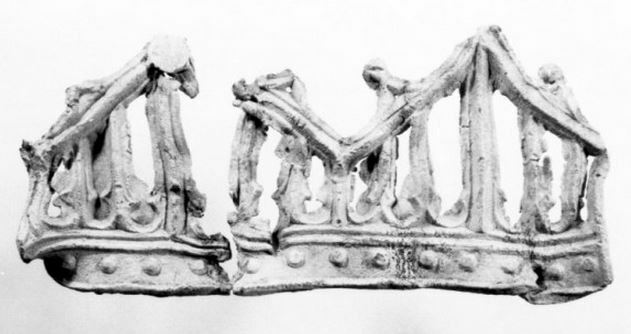 Indeed, in this context it is interesting to note one final metal-detected find from the Ketsby DMV, namely a fragment of lead openwork frieze, which the UKDFD record notes may be 'of some significance', given the historical evidence for an important image of St Margaret here. With regard to the decline of the village and its church, only a little can be said here. As was noted above, Ketsby was actually granted a market in 1524 and the image of St Margaret in the church was still receiving notable offerings in 1529, with the implication that Ketsby was continuing to function as a local pilgrimage centre then (with this continued religious activity perhaps helping to explain why a new market was created here in the 1520s). Although the image of St Margaret clearly still existed in 1534—when the parson of Ketsby (John Cocke) stated in his will that he wished to be buried 'in the chancel before the image of St Margaret'—the Reformation must have had a significant negative effect on the village and its church, and 1597 saw the last institution of a priest at Ketsby church. Indeed, by the eighteenth century the church was ruinous and it now only survives through chance finds such as the frieze mentioned above, a medieval cresset lamp found on the DMV, and a lead cross perhaps originally from one of the graves. Similarly, although a few houses remain at Ketsby, there are only cropmarks to tell of the main village that once existed here, with the village earthworks having been bulldozed and levelled in the mid-1960s, around the same time that the surviving medieval barn at Ketsby House (variously dated to the fourteenth century and c. 1500) was pulled down. 1 In this context, it is interesting to note the tentative suggestion made below that the name 'Walmsgate' may have originally applied to a relatively large pre-Viking estate that included Ketsby DMV within its bounds. The first part of the name Walmsgate, Walmesgar at Domesday, appears to be the name of a pre-Viking owner of this estate or gāra, 'triangle of land', and one possibility is that he was called Walhmǣr, a name that includes the Old English term for a Briton or Welsh-speaker, although it might well be dangerous to press this point too far! 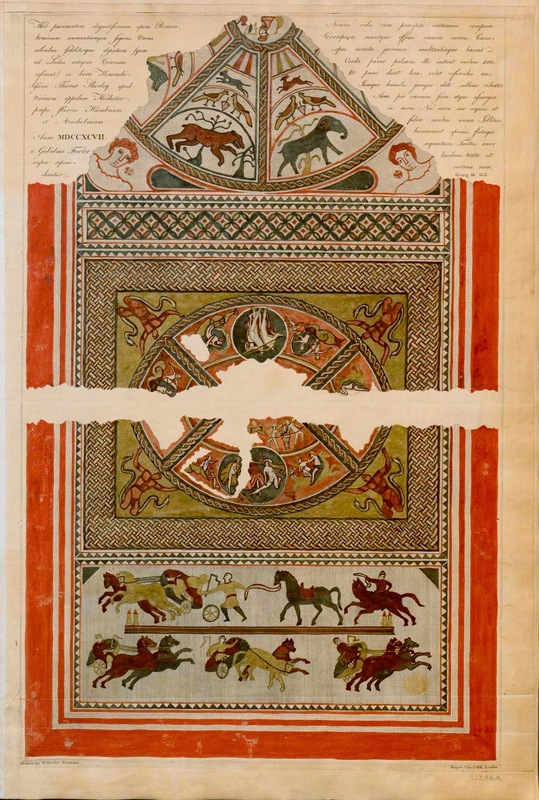 The above post is based on records held by the local Historic Environment Record, English Heritage's Pastscape, the Portable Antiquities Scheme (PAS), the UK Detector Finds Database (UKDFD), and the East Midlands Anglo-Saxon Pottery Project (EMASPP). Images from the PAS database are used under their blanket CC BY 2.0 license; those from the UKDFD are used under the 'educational, non-commercial' permission granted by point 2.2 of UKDFD's 'Terms and Conditions'; if there any objections to me using the latter pictures in this article, please contact me and I will remove them.